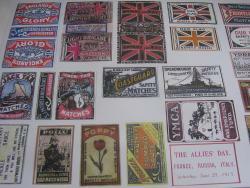 Replica Matchbox Labels (Assorted - mainly patriotic themed). England's Glory, Light Brigade, Our Flag, Frontline, Coastguard, Torpedo, Dreadnought, Poilu, Ypres, etc. etc. 20 different. Glue to your own boxes.